NEW YORK (AP) — Shaky camera footage depicts the gory scene: A driver who police say was frightened when a group of motorcyclists swarmed his Range Rover plowed through them, striking a rider in a purple T-shirt and black helmet. The biker, Edwin Mieses Jr., suffered broken legs and spine injuries, his wife, Dayana Mieses, said Tuesday outside a hospital. "There's no hope for his back," Dayana Meises told reporters. "They crushed his spine. They broke it in two different places, so he will be forever, forever paralyzed." Another man also was injured. Bikers chased after the SUV, then beat the driver, police said. A portion of the Sunday altercation, captured on a helmet-mounted camera worn by another rider, was posted online anonymously. Since then, Dayana Mieses said, the bikers have been potrayed as villains who ambushed an innocent man driving his family. But she said her husband is the victim. "Everyone wants to blame the bikers for something this man did," she said. Edwin Mieses, known as Jay Meezee, is an aspiring rapper from outside Boston, and the couple has two children, ages 15 and 9. Dayana Mieses told Boston station WBZ-TV that her husband got off his bike to help another rider who was struck in an initial collision with the SUV. "When all the bikers stopped, my husband got out, parked his bike to walk over to try to help his friend," she said. "He walked over towards the front of the vehicle when, at this point, I don't know what happened: the man was scared, the man just peeled off and ran over my husband." 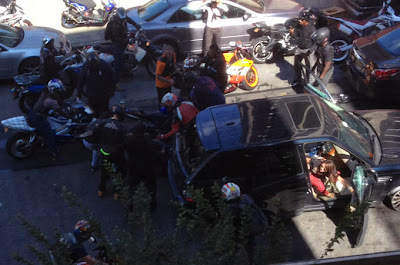 Mieses was part of an unauthorized motorcycle rally. The video shows a large group of bikers clustering around the Range Rover heading north on Manhattan's West Side Highway. One of the bikers then moves into the SUV's lane and rides briefly alongside it, peering in through the driver's side window. It's unclear from the video what the driver might have done to anger the motorcyclist.The biker then cuts in front of the Range Rover and, still staring at the driver, suddenly slows down. It isn't captured on the video, but the motorcycle and SUV bumped, police said. The motorcyclists, 20 to 30 in all, then stop on the highway, blocking the SUV's path. Some dismount and approach the vehicle. Police said some of the bikers then began damaging the Range Rover. The video shows the SUV suddenly accelerating, bouncing over at least one of the motorcycles and its rider as others scramble to get out of the way. The cyclists give chase, pursuing the driver for about 2.5 miles. The bikers succeed in getting the SUV to stop. The chase ended when the SUV exited the highway and got stuck in street traffic. The video shows one biker using his helmet to smash the driver's window. Police said the group then pulled the man from the SUV and beat him, although that part isn't shown on the recording posted online. The police department confirmed that the video circulating online is authentic. The driver of the SUV, Alexian Lien, 33, was taken to a hospital where he needed stitches for his face. His wife and 2-year-old were not injured. He has not been charged. But Police Commissioner Raymond Kelly said they were still investigating the incident. "Well, it depends on what the circumstances are," Kelly said. "It depends on whether or not your vehicle is being attacked, whether or not you think you're being attacked, whether or not your wife and child's in the car. You have to look at the totality of the circumstances, and that's what we're doing." On Tuesday, police arrested the biker they say was involved in the initial accident. Christopher Cruz, of Passaic, N.J., was charged with reckless endangerment, reckless driving, endangering the welfare of a child and menacing. Cruz, who was uninjured, was in custody awaiting arraignment Tuesday and hadn't been assigned a lawyer. A second suspect — Allen Edwards, 42, of Queens — believed to be the man seen on video striking the Range Rover windows with his fists, surrendered to police on Tuesday. He was charged with reckless endangerment, criminal mischief and menacing. It was not immediately known if he had a lawyer. Police are still seeking a biker seen smashing the SUV's window with his helmet. Who appears to be the victim? Biker or Driver and Family?